Today at the JavaOne Latin America 2015 I heard an interesting talk about Oracle Linux. I is basically another Red Hat Linux Clone. But it has one interesting tool on board which can save your life if you run into problems in a mission critical Java application. This tool is called DTRACE. It was developed from Sun Microsystems for Solaris 10 and gives you access to thousands of instrumentation hooks called probes. This tool is non invasive for your application and has a very low performance overhead. So you can use this tool in production. 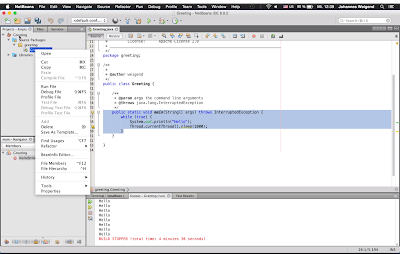 Oracle has ported DTRACE to Oracle Linux and you can use DTRACE in production of your Java application. What is even better: DTRACE was also ported to Mac OS X and runs on every Mac out of the box. This helps a lot to build your own D scripts for profiling or debugging purposes. 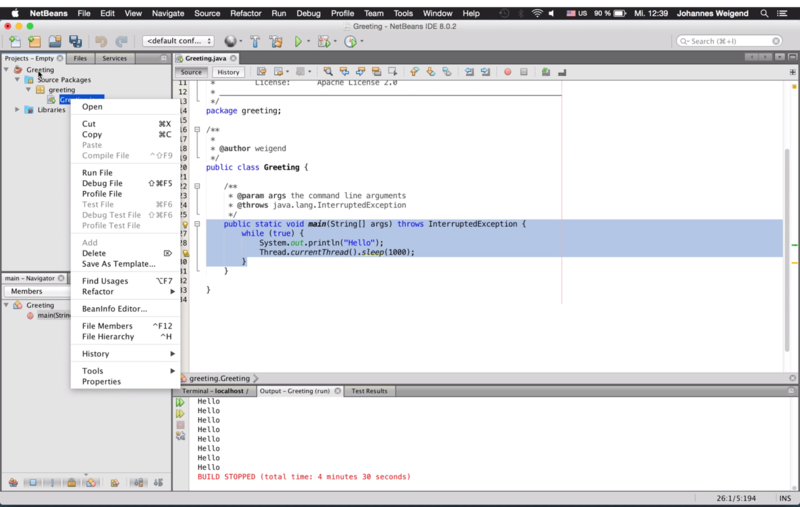 After the session I tried this with NetBeans. And it worked in one minute. The results are shown in the video. I am really impressed. As you have seen in the video there is only a short script necessary to count each method call and remember the name of the called method. Since method calling scripts could have impact on your performance you have to enable the method call probe by starting the JVM with an special -X parameter. There can be problems when your server will be slow and normal tools like stack-traces or heap dumps show nothing abnormal. Then you need any information what your program is really doing. A profiler can help you. But the problem here: In most enterprises you will not get access to the root level of your production servers. But sending a small DTRACE script to the administrator team for execution will work fine since this tool does not need any special system configuration like open ports or the installation of profiler software. It is much simpler and easy to use than the JRocket based Flightrecorder which is also an option when you try to profile production systems. Since the JVM has support for DTRACE it would be great to have this functionality available on every Linux Platform. There are lots of information about latest technology and how to get trained in them, like Oracle Training in Chennai have spread around the web, but this is a unique one according to me. The strategy you have updated here will make me to get trained in future technologies(Oracle Course in Chennai). By the way you are running a great blog. Thanks for sharing this.